In original early aviation drawings, the terms used at the time varied from manufacturer to manufacture and frequently from page to page! Many of these are no longer commonly used today, are spelled differently, or have different meanings. Aileron – still used today, refers to the ‘flaps’ of the wing. Empennage – a term used for the horizontal stabiliser and sometimes for the complete tailplane assembly. Fixed Tail Plane – the horizontal stabiliser. In early Sopwith drawings, the term “empennage” is used to denote the fixed horizontal stabiliser. In later Camel drawings the term “stabiliser” is used. Flying Machine – One hundred years ago, the term aeroplane or airplane wasn’t in common use. 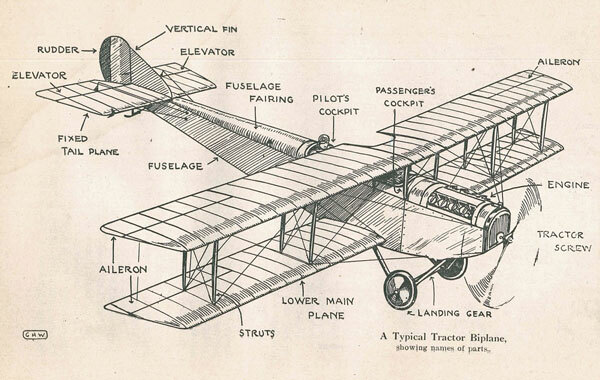 In drawing above, the term “Tractor Biplane” is used. The terms “Crate” and “Kite” were also frequently used. Horizontal Stabiliser – another term for Empennage or Fixed Tail Plane. Undercarriage – what we commonly refer to today as “Landing Gear”. Plane – on the earlier Strutter drawings, plane denotes the wing. An example is the “lower main plane” would be the “bottom wing”. Vertical Fin – is the same as the vertical stabiliser or fin. 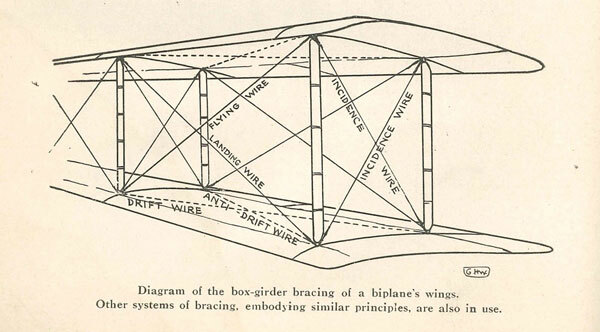 Wire – was used to brace the structure of early flying machines. Bracing wires, flying wires, landing wires, and drift wires kept the structure intact. As the war progressed “streamlined” wires began to supplant, but never completely replaced, the many exposed wires and cables.